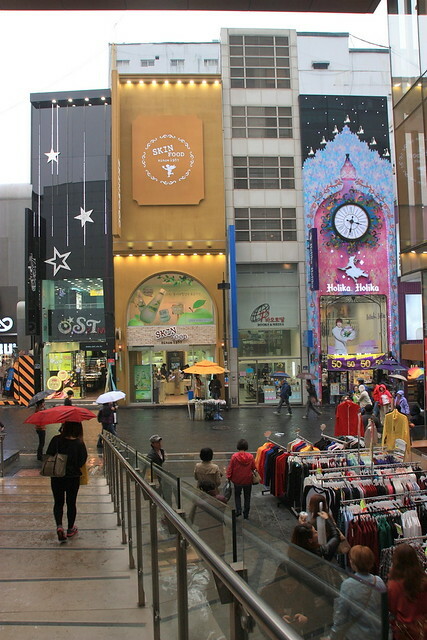 Myeongdong is the most popular shopping district in Seoul, much like Orchard Road to Singapore and Bukit Bintang to Kuala Lumpur. 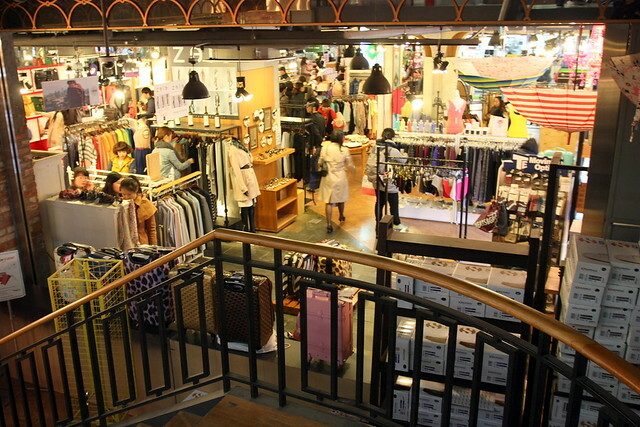 Unlike Namdaemun or Dongdaemun, many designer brands are sold in Myeongdong. 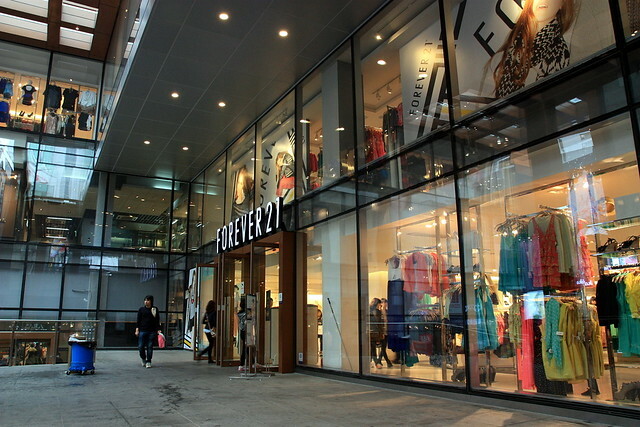 In addition, several major department stores include Lotte Department Store, Shinsegae Department Store, Myeongdong Migliore, Noon Square and M Plaza. 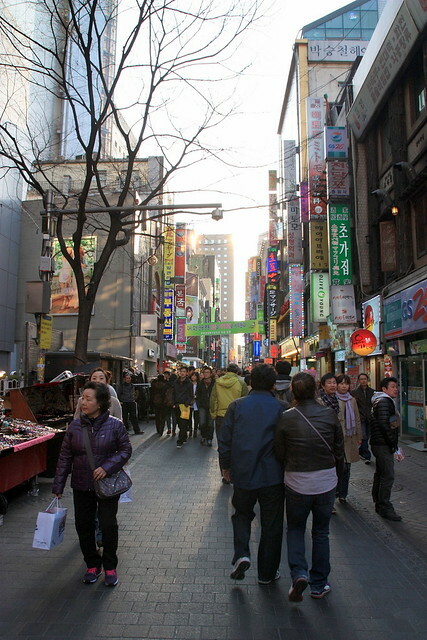 Myeongdong is also a one stop centre for tourists. 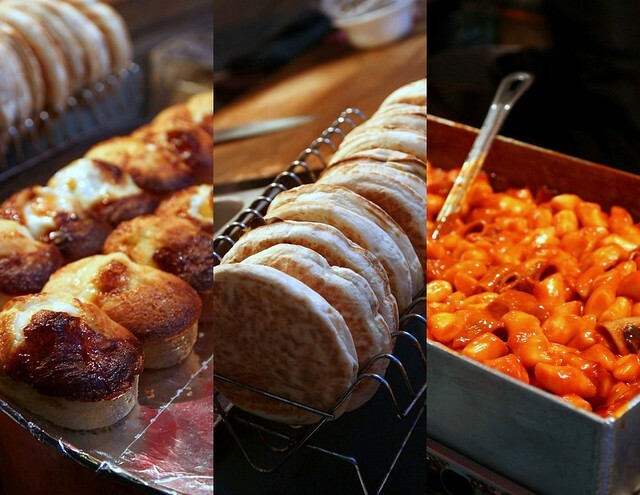 There are many fast food restaurants, cafes, korean restaurants and food stalls in Myeongdong. Other businesses include money changers, jimjilbang (korean spa), hair salons, banks and theaters. 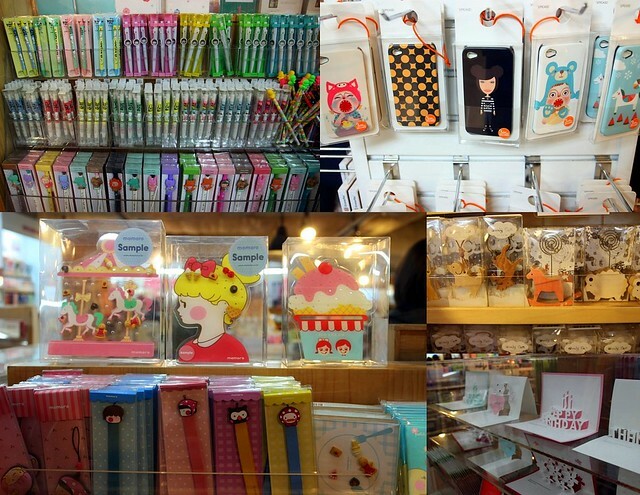 Hence, it is not surprising that we found ourselves at Myeongdong 3-4 times during our one week trip in Seoul. 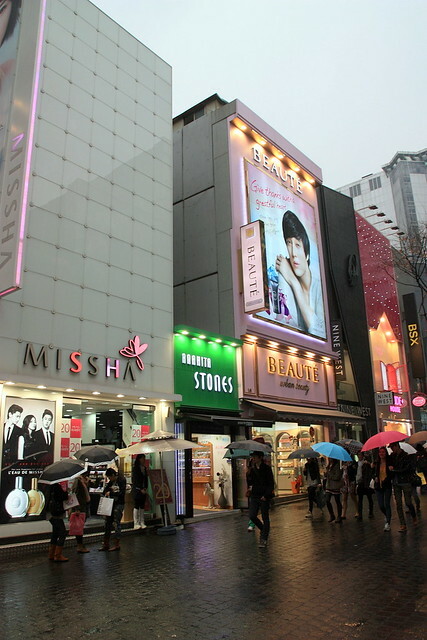 Every Korean cosmetic brand has a branch in Myeong-dong. 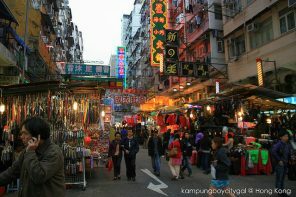 The market is home to roughly a thousand cosmetic shops and hundreds of skin-care stores, hence competition is really fierce. The sales assistant will often entice walk in customers with free samples. 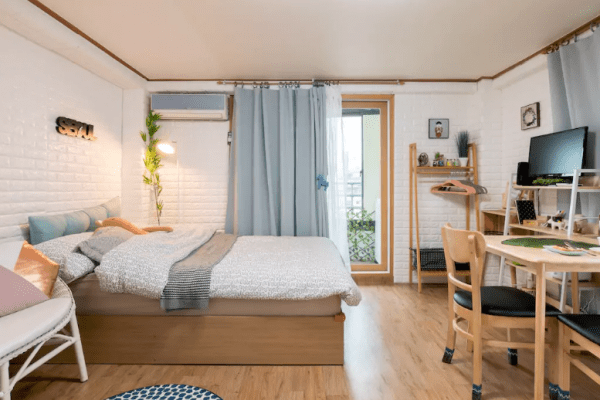 You can still take it even without making any purchases. And if you really do buy something, they will stuff you with even more free samples! 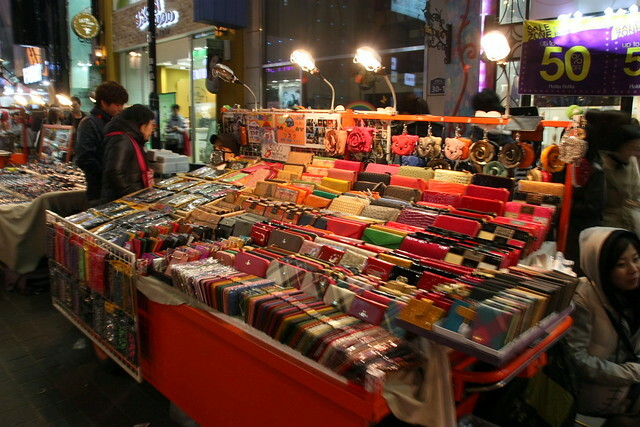 We often end up with plenty of free samples after spending an hour or two at Myeongdong. 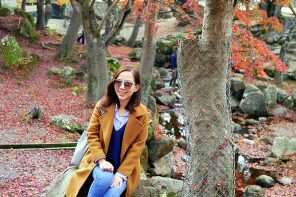 If you’re a visitor to Korea (or a non-resident) and are buying goods above 30,000 won at a tax refund eligible outlet, you may claim for tax refund at the airport. Just fill up the blue or orange colour form at the counter. 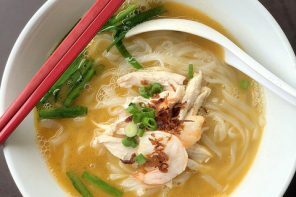 Read more about the procedures of getting your tax refund here. I love Kosney! 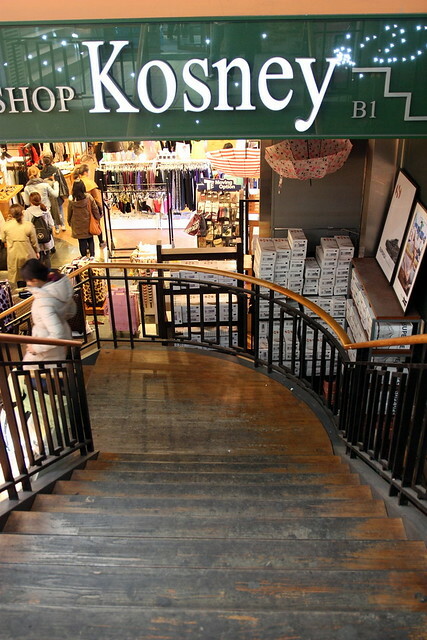 It sells clothes, stationery, shoes, hats, and design products that particularly that attract young girl, or woman who is young at heart. 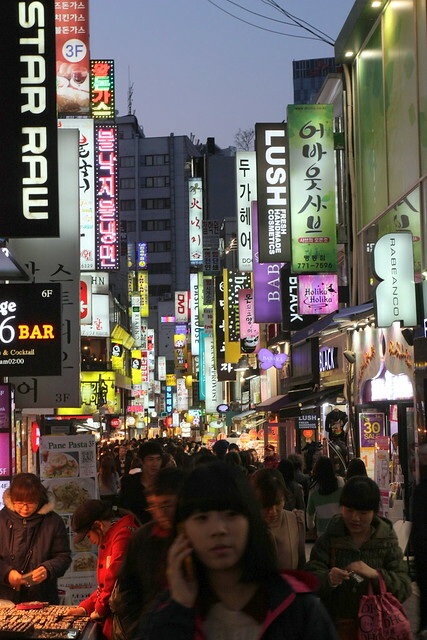 Myeongdong gets even more crowded in the evening as this is a very popular place for Korean youngster. They come by after school/work. 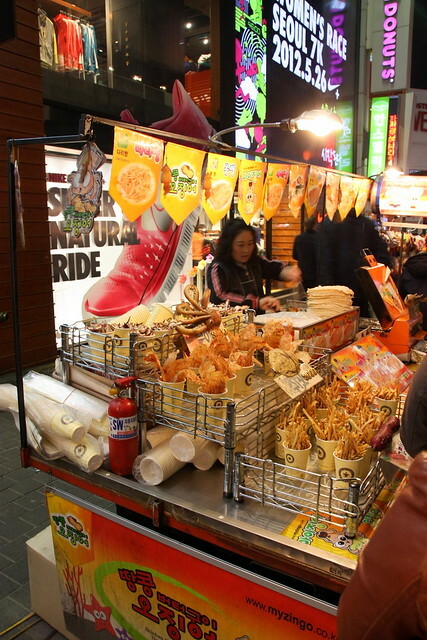 During night time, more stalls at opening by the side of the streets too. 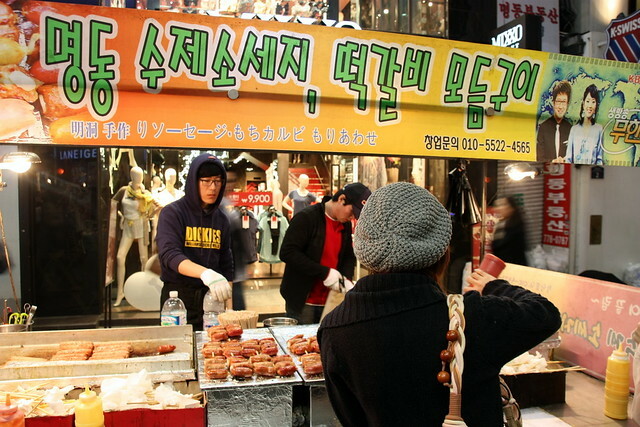 Street food stalls are also aplenty in Myeongdong. 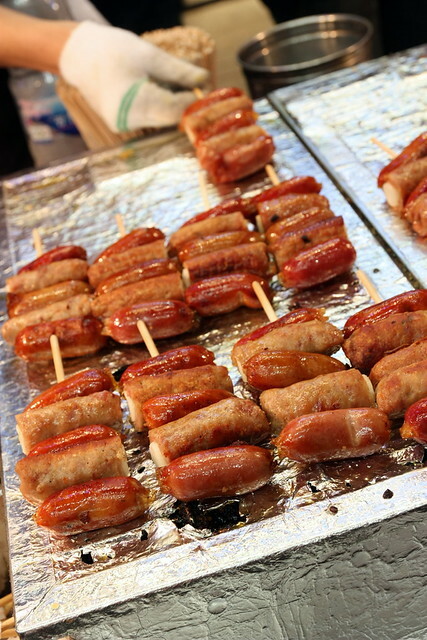 It is best to have a light dinner, do some shopping while trying all sorts of Korean street snacks.